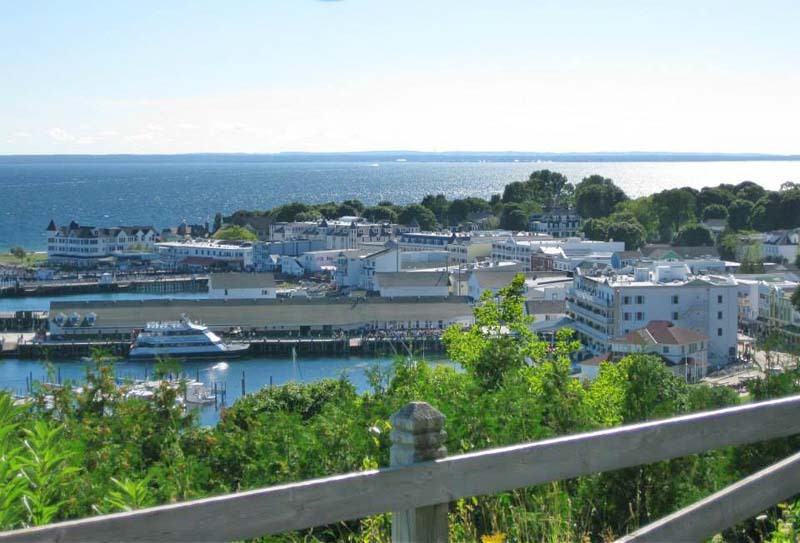 I’m sure you’ve heard of Mackinac Island, a Michigan favorite! Well, you CAN get there from here, but you CAN’T drive to do so. Catch a ferry from Mackinaw City or St. Ignace for the short ride. There are no cars allowed on the island. Charming. 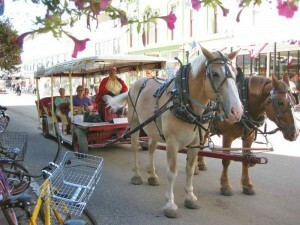 You can enjoy Mackinac Island many ways. 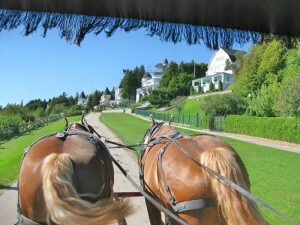 One is to take a carriage tour. These horse-driven tours give oodles of information and show you many sights of the island including the Butterfly House and interesting Arch Rock. 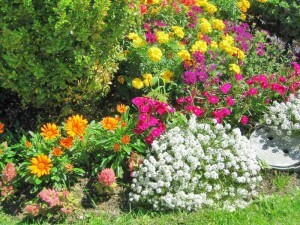 Restaurants and beautiful gardens abound on the two main streets and up the hill as well as more shops than you’d care to visit. The views of the Straits of Mackinac and the Mackinac Bridge are gorgeous. If you’re up to it, take a bike ride around the island. There are plenty of rental spots right off the ferry docks. It’s about eight miles around, all paved. You can make it in an hour, but most likely, you’ll want to take a bit more time so you can get off your bike and dabble your feet in the crystal clear cold water. Ride by horseback! Hike up into the middle of the island or around the island if you choose. Sit on the porch of the Grand Hotel (although that comes at a bit of a price). If you visit Mackinac Island for the day, you’re considered a “fudgie” because few folks leave without a pound or two of Mackinac’s popular delicacy (and maybe a pound or two on the hips from all the free samples!). 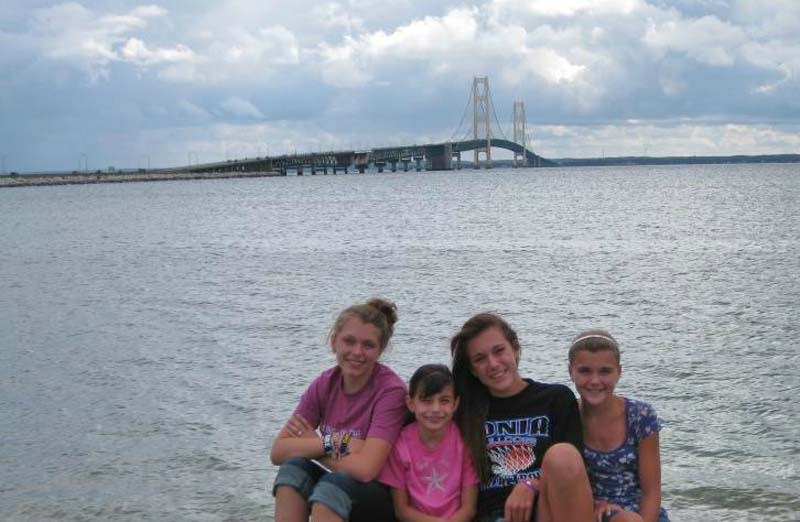 Summer stays on the island are pricy, but there are plenty of choices in nearby Mackinaw City or St. Ignace. While you’re in St. Ignace, you might like Castle Rock. Hang out with Paul Bunyan and Babe the Blue Ox! Head east to Sault Ste Marie, the Soo Locks. Boat tours take you through the locks. Very interesting! Or head north to the Tahquamenon Falls State Park, an Upper Peninsula gem. Hike to your heart’s content. Tour the Quincy Mine in Hancock and see how copper mining was done between 1846 and 1945. At Kitch-Iti-Kipi (The Big Spring) help guide a cable boat over the water that never freezes. Pictured Rocks National Lakeshore is considered the best place to see in the Upper Peninsula. Head to Munising and sign up for a boat ride with sights you’ll never forget. There’s so much to do, something for everybody! This entry was posted in Events and tagged Annual Conference, cobac17, fudge, grand rapids, horse carriage, Mackinac Island by janfb. Bookmark the permalink.